Treasures My Husband Hates: Homemade light box. I'm getting to start the lovely task of cataloging all my pyrex. I'm going extreme and making a book for myself with everything I own (pyrex) and labeling it and adding notes. Trying to get all my pictures to look like this, uniform and simple. 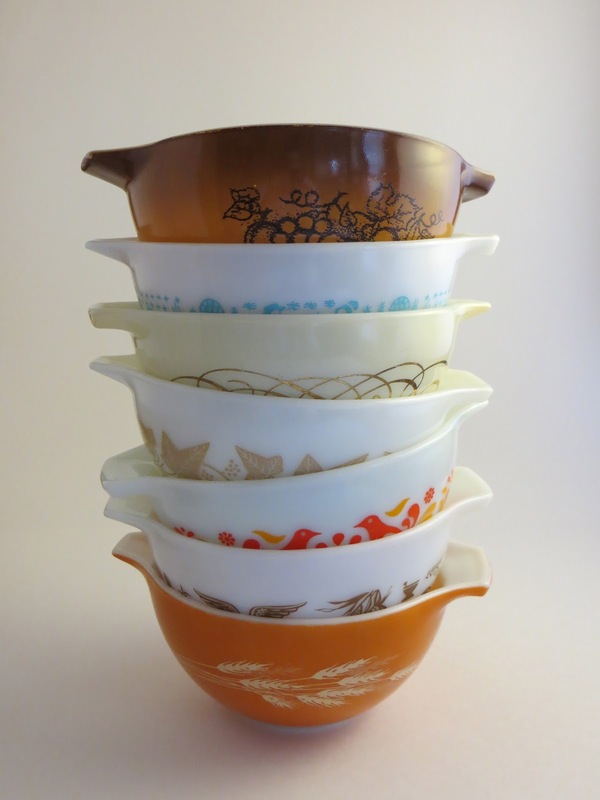 In order to make this book I wanted to take picture that showcase just the pyrex and use a neutral background. I also wanted the pictures to look the same. 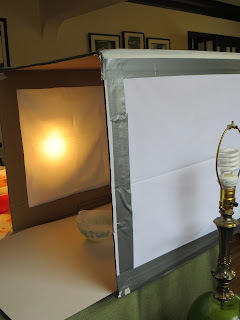 Since I don't want to spend money on a light box I made my own. I searched for a box. Found one in a recycle bin a few alleys away. A little duct tape, some white fabric, box cutter and poster board I came up with this. It works wonderful. I cut out 2 sides. I then duct taped a double layer of white quilters fabric (that I had on hand) over the cut outs. I then played the matte side of the poster board up inside it. Curved at the back so you don't see the seams. How do the pictures look? Two lamps with no shades on the sides allow the perfect light to come inside. must work on it do I don't get reflections. Pretty happy with my cheap light box. Now if only THM would leave it alone. Boxes are the best toys, for both kids and adults.